Some members of the Techiman North constituency branch of the ruling New Patriotic Party (NPP) had debunked allegations of tension in the area following the suspension of the party’s elections in the constituency on Saturday, 24th February 2018. 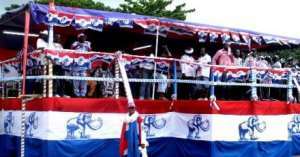 According to the group calling itself Concern NPP members, Kessbenfm.com fabricated the press statement that claimed there was tension in the constituency. In a statement, the group is calling on the general public to ignore the “malicious, fabricated and fraudulent press statement spearheaded by ghost individuals in the constituency who seeks to retard the forward march of the constituents in the party. It's very strange to see former constituency executives being signatories to a statement purported to be coming from constituency executives”. With reference to the concocted and fabricated press statement published on Kessbenfm.com yesterday, 24th February 2018, we Concern NPP members of Techiman North constituency wishes to set the records straight for the sake of party unity and cohesion. We believe in our leaders at the National and Regional level and their decisions are always supreme, therefore after the directives to suspend the elections, peace, calmness and tranquillity has totally prevailed in our cherished constituency. It's very disappointing to drag the name of the good old Prof. Ameyaw Akumfi who contributed immensely to ensure a landslide victory for NPP in the constituency into a decision taken by party leadership. Prof has no interest or whatsoever in this election so it's strange for unseen ghosts to attribute their current frustrations after party leadership has spoken to father for all, Prof Ameyaw. On record, the honourable DCE, Peter Mensah being linked to the suspension of our constituency elections is untoward and not welcoming. We are optimistic that, this action is nothing but a step to soil the hard earn reputation of the duo, HON PROF. AMEYAW AKUMFI AND HON PETER MENSAH. We hereby congratulate our sister constituencies for electing committed party faithful to man the affairs of the party at the constituency level.